This family study was where Cantor Eisemann prepared for Shabbat services. It also housed the community archives as well as a library. 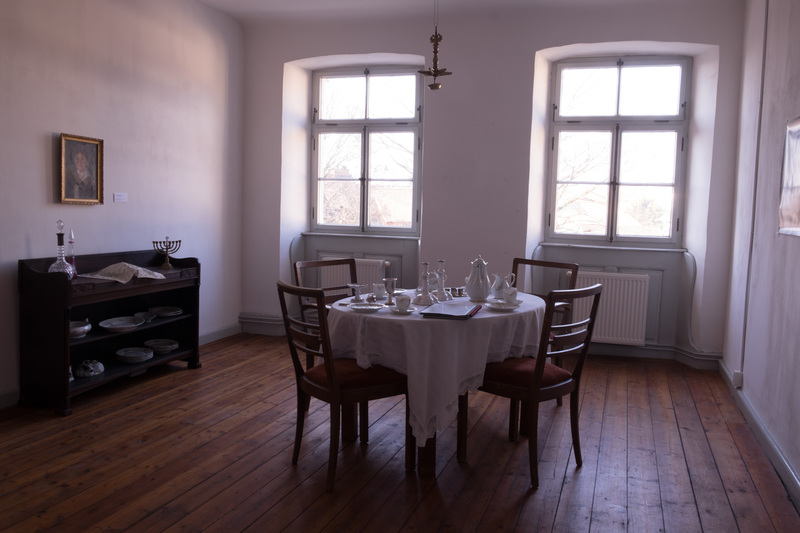 Today the former study contains a table set with a fine coffee service and two Shabbat candlesticks. A Shabbat lamp, welcoming the visitor, hangs from the ceiling. These objects once belonged to Jewish families of Breisach – the Geismar-Dreifuss, Kahn-Weil, and Bergheimer families. A special plate to hold Challah, or Berches, the ceremonial bread baked for Shabbat, is also seen. Challah has a unique shape, including a braid on top of the loaf, sprinkled with poppy seeds. A knife, specifically designed to slice the Challah can also be seen. A booklet with a dust jacket containing a photograph of the 1874 wedding of Alexander Geismar and Leonie Epstein (from Eichstetten) lies next to the coffee service. This booklet indicates that the coffee set was a wedding gift. An ancestral tree includes the fate of the family in the photograph. Eight of the 18 family members pictured here became victims of the Shoah. There is a portrait of a Jewish woman from Ihringen in festive attire on the wall. One can also see a view of Breisach from the west. Raphael Levi took it with him when he emigrated to Zurich in 1939. His grandson, Leopold Marx, donated it to our collection. Herta Dreifuss (born Breisach 1906 – died Lengnau, CH 1977), the granddaughter of Alexander and Leonie was able to take the coffee set with her when she emigrated to Switzerland in 1933. Herta cared for her grandparents until their deaths – Alexander in 1929 and Leonie in 1933. They are buried in the new Jewish cemetery on Isenberg. In 2011 she donated these family treasures to the Blue House. Two large-format photos show Natalie and Julius Baehr in their apartment on the market place (Werd), taken by their son, Heinz Baehr. Another image by the same photographer shows the Judengasse with the community center at the far end, after a Sabbath service in 1937, the year Heinz Baehr fled to New York. His photographic documentation of (Jewish) every day life and special occasions in Breisach is now part of the collection of the Jewish Museum in Berlin and the Holocaust Memorial Museum in Washington, D.C.